Three-quarter length portrait of a young woman depicted as 'Stella', the subject of Jonathan Swift's 'Journal to Stella', in profile to the right with her face turned to three-quarter view. She has long dark hair, which is tied away from her face with a lace and ribbon cap, a string of coral beads around her neck, and an ivory-coloured dress patterned with bouquets and posies of flowers with half-length sleeves. She is seen standing next to a highly elaborate wooden sideboard with a marble top, a sheet from a letter in her hand (presumably from Swift); before her, on the top of the sideboard, are the other sheets of the letter, a bronze figurine, and a large dark aquamarine-coloured jar. The drawer of the sideboard is slightly open. Stella 1868 Sir John Everett Millais 1829-1896 Oil on canvas This is a fanciful portrait of Esther Johnson, friend and companion of the author Jonathan Swift, who is best known for the satirical Gulliver's Travels. The relationship between the two was close. It is possible that they were actually married, although they never cohabited as husband and wife. 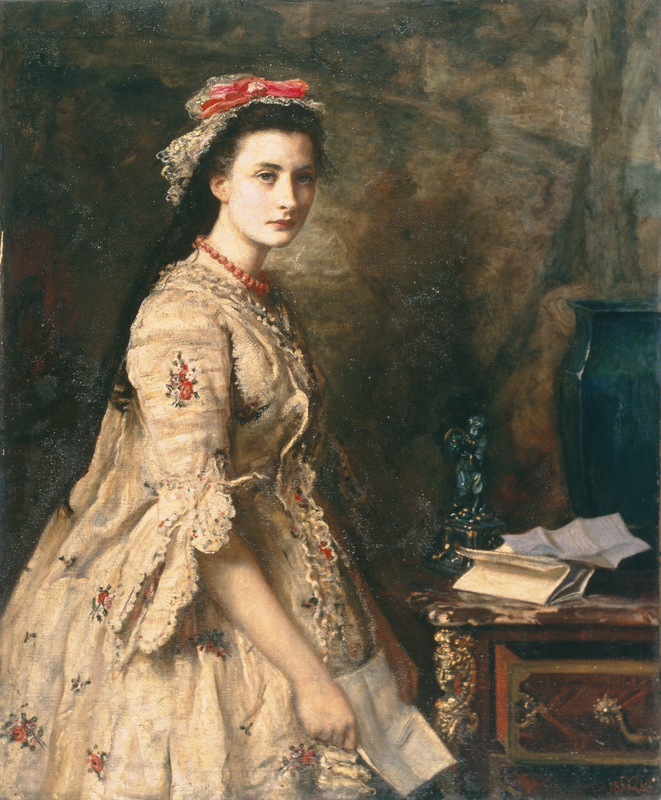 Swift wrote Esther letters between 1710 and 1713, later publishing them as Journal to Stella. They are a rich, informal source of information about his daily life and about the politics of the period. Here, we see Esther, or 'Stella', with his letters. She wears an appropriately eighteenth-century costume.